Bomaderry’s IJED Electric and Data is proud of its strong reputation for delivering on jobs of all sizes, from installing powerpoints to connecting new residential subdivisions to the electricity network. Director Dylan Jorgenson said the key to the company’s continued success was its ability to take on work that other companies weren’t willing to do - to “step outside the comfort zone”. Dylan is a third-generation electrician. The company was started in 1989 by his parents, Ian and Rhonda, who are still involved in the business today. Working from a backyard workshop, the company initially specialised in dairy farm refrigeration servicing from Wollongong to Bega. Jason Boome started as a director in 2006 and Dylan joined him in 2013. IJED now employs 25 people, including nine apprentices, and is a Level 2 service provider, which allows the company to work on the Endeavour Energy network. “Because we are a Level 2 service provider, we have access to jobs that other businesses wouldn’t want to take on,” Dylan said. 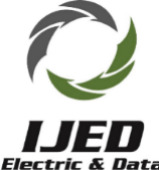 As well as electrical work, IJED provides specialised data networking services and solar installation work. One project of which Dylan is especially proud is the renovation work the company carried out on the Sunset Room at Bomaderry Bowling Club. The “unbelievable light job” included installing a C-Bus automatic controller, allowing the LED lights to be set for particular events, to be controlled from other parts of the club and to turn on at scheduled times. Dylan said being based in the Shoalhaven gave the company a strong geographical advantage. “From a strategic point of view we have access to a large population within 90 minutes,” he said. “We’re a reasonable travelling distance to Sydney, and even closer to Wollongong, the Southern Highlands, Eurobodalla and the Wingecarribee. “The numerous manufacturing facilities in the region offers companies like us opportunities to take on projects without needing to access resources from outside the Shoalhaven. Dylan and Jason have completed the Advanced Diploma of Leadership and Management offered by the Shoalhaven Professional Business Association (SPBA) at the Shoalhaven campus of the University of Wollongong. “Our company was going through a growth phase and we didn’t have a very well structured business plan. We now have a concrete plan of where we want to go, and how to take the right steps along the way,” Dylan said. Dylan encouraged new businesses to relocate to the Shoalhaven and take advantage of the many opportunities on offer. “There is access to more people than you will probably ever need for a small business and every opportunity to go further than you imagine. “The demographic of the area is changing and it’s largely an older population. Any young people we can get into the area and push for growth is going to help.